Retail inventory shrinkage is the difference between a product’s recorded stock count and the amount physically on-hand. Lost stock stems from theft or inventory control issues like receiving errors, unrecorded damages, cashier mistakes, and misplaced items. Inventory control procedures and retail point-of-sale (POS) reporting tools help retailers spot, combat, and prevent retail shrink. 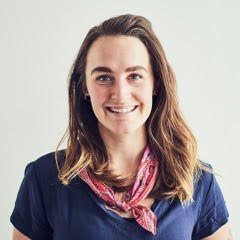 Retail point-of-sale (POS) systems like Vend, which sponsored this article, give retailers the tools they need to tightly track and control product data like pricing, stock counts, and receipts, plus grant or limit staff access to sensitive information. 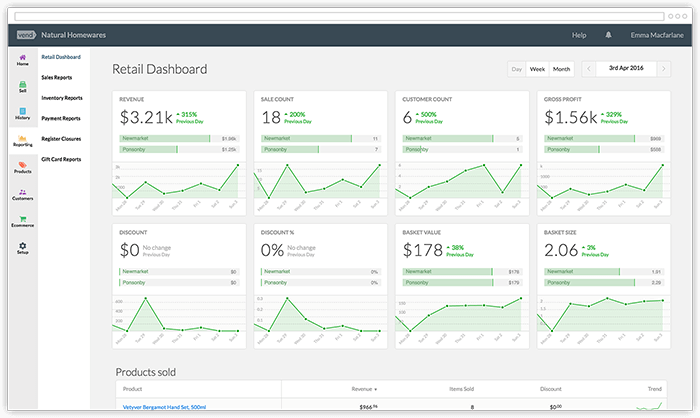 All of these features help business owners identify, and prevent inventory shrinkage before losses start to add up. Inventory shrinkage is recorded when a product’s listed quantity-on-hand exceeds the actual physical count. The difference between these two amounts is referred to as “shrink.” In a retail setting, this is sometimes called retail shrink; and in warehouse or manufacturing business, it’s generally reported as inventory shrinkage. Either way, it means the same thing — you’re missing inventory that you thought you had. When your recorded and physical stock counts don’t match it’s called inventory shrinkage. The loss can be real, like shoplifting theft, or just a clerical error, like a typo during receiving. Inventory counts must be adjusted to reflect the actual quantities on-hand and the adjustment mirrored as inventory shrinkage in the store’s bookkeeping system. The store owner and staff need to identify the root cause of the shrink — theft, stock mismanagement, checkout errors, or unreported damages are all common culprits. Whenever inventory shrink occurs, it’s important to look deeper to determine if it’s a unique occurrence or part of a larger trend. A single occurrence should be noted and watched, but If the investigation points to a trend, retailers must quickly put remedies in place to prevent further losses. According to the National Retail Federation’s (NRF) 2018 Retail Security Survey, customer theft, employee theft, and clerical and administrative errors are the three leading causes of retail shrink across all types and sizes of retail operations. Customer and employee theft are the leading culprits in inventory shrinkage, followed by clerical errors related to inventory control. Source: National Retail Federation 2018 Retail Security Survey. Customer theft accounts for the majority of retail shrink — more than 35 percent, according to the NRF. Shoplifters take advantage of unobserved areas throughout your store, the spaces between aisles and racks, and dressing rooms to do their dirty work. Tag swapping is another pervasive form of retail shrink that directly affects inventory numbers and profits. Tag-swappers place a lower-priced item’s tag on a higher-priced product but actually complete a purchase. This hides the theft initially, but it throws inventory numbers off for both goods. Unfortunately, it’s generally uncovered long after the fact during stock counts. Other types of customer theft, like coupon scams, affect your profits and bottom line but aren’t revealed as missing units. This type of loss is uncovered by examining sales figures and discount reports — and where using a POS system like Vend really comes in handy. Retail shrink from employee theft takes second place behind customer theft, according to the NRF report. 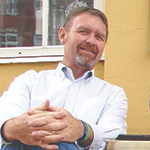 Unfortunately, internal theft can be very difficult to spot and remedy. 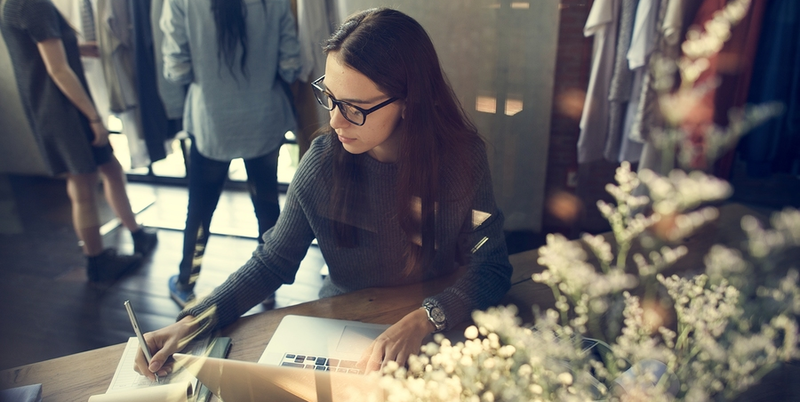 Since employees have access to extended areas of the store and know sales and inventory control processes, it’s easy for untrustworthy staff to steal goods under the radar. Marking sellable goods as damaged, stock receipt miscounts, sliding items to friends during checkout, and applying excessive discounts top the list for internal theft. A POS system that supports assigned staff logins and system restrictions, like Vend, gives store owners the advantage by limiting staff access to key data and tracking all system activity to staff-specific user IDs. 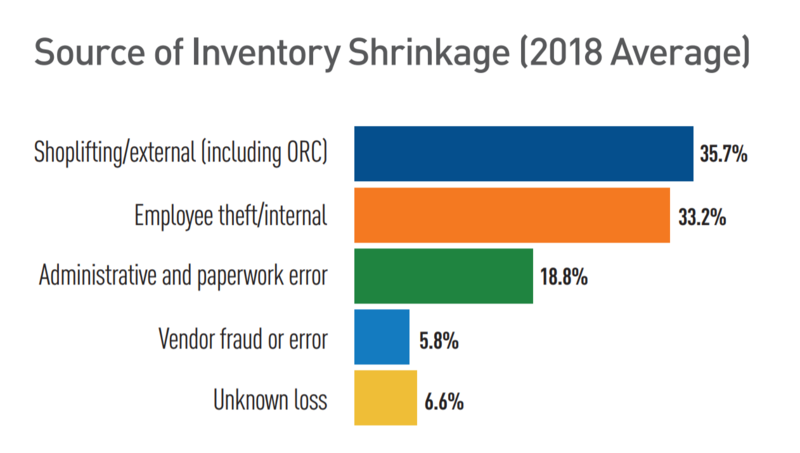 Inventory control and clerical errors account for nearly 19 percent of inventory shrinkage, according to the NRF study. However, these problems can be the easiest to identify and solve. Some are simple miscounts that aren’t connected to actual losses. Others can be very costly, like recording all of the goods in a supplier shipment as received-in-full when some items were actually missing from the shipment. Retailers large and small must contend with all three retail shrink issues throughout the course of business. The NRF reports that customer and employee theft account for more than half of retail shrink, while stock control mistakes and clerical errors are next in line. Once you know the most common causes of inventory shrink, you can try to uncover the exact issues you face — stock-keeping problems or actual theft. After that, you’re ready to adopt solutions to remedy shrink — and get ahead of problems before they turn into costly headaches. Even though theft is the most prevalent cause of inventory shrinkage, having tight control over inventory is your first line of defense. 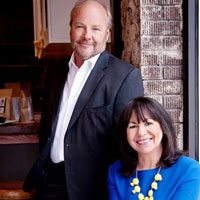 Without accurate inventory numbers and regular inventory management procedures, chances are you’ll never spot shrink issues to begin with. Once any clerical and receiving problems are remedied, you’re set to spot and combat theft-related retail shrink with training, monitoring, and visible deterrents. Here are ways to minimize and prevent all three types of inventory shrink that you’ll encounter at some point in your retail operation. Clerical and stock-keeping errors are the number-three cause of retail shrink. However, they’re the easiest problems to fix through improved stock receiving, counting, and tracking procedures. Since having accurate stock counts is key to spotting theft-related shrink quickly, shoring up store processes and systems should be the first task on your list. Having a sound inventory management process is the first step in preventing inventory shrinkage due to clerical and stock control errors. Inventory management procedures are easy to implement and ensure that stock receipts, cycle counts, and damage tracking are all handled correctly. Pairing good inventory management procedures with a feature-packed POS system like Vend is the best way to combat shrink from stock management, clerical, and checkout errors. Powerful inventory control tools like real-time inventory adjustments per-sale, automated receiving, barcode scans at checkout, and detailed sales and inventory reporting, all minimize errors and help retailers quickly spot shrink when it occurs. 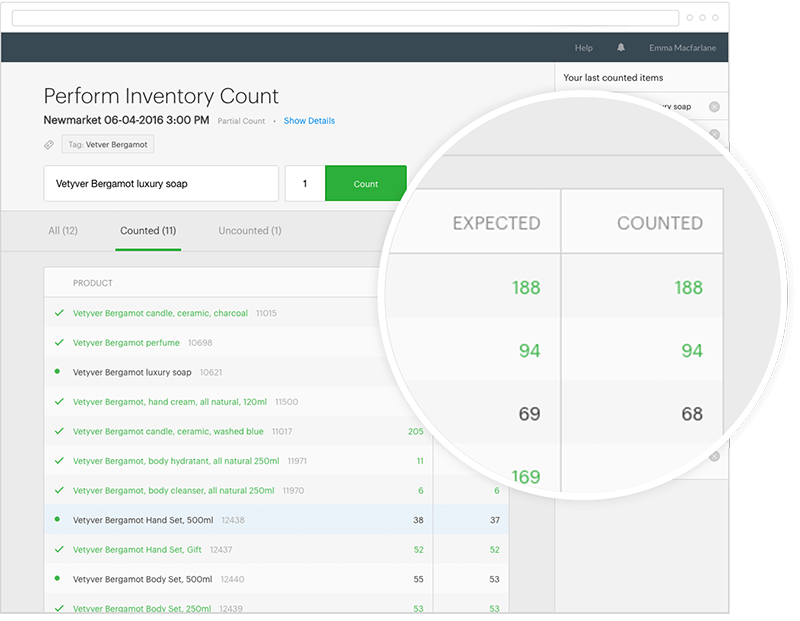 Inventory and line-item sales reports in POS systems like Vend help retailers spot stock mismanagement and sales-related inventory shrinkage issues. Cycle counts are partial stock counts conducted regularly to spot retail shrink and other stock control issues like misplaced or mistagged stock. Unlike annual counts which require preparations and dedicated time to complete, cycle counts are small spot-checks of stock that you can use to check stock count accuracy, catch shrink, and make necessary adjustments. Scanning barcode labels at checkout reduced sales entry errors, plus it speeds up your checkout process tremendously. As long as your products are properly tagged, barcode scanning virtually eliminates mistyped item codes and prices at checkout, keeps your sales and inventory counts accurate, and cuts retail shrink. 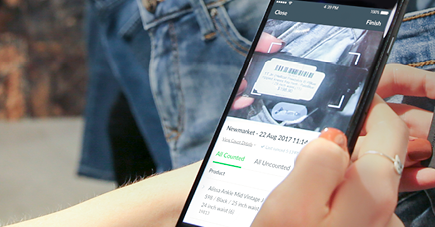 Barcodes also speed up cycle counts and stock lookups for stock control checks, especially if you use Vend’s free iPhone scanner app. Vend creates, stores, and prints barcode labels, so from receipt through sale, you can easily track every item in your store and even count using Vend’s iPhone scanner app. First-in, first-out inventory management, known as FIFO, dictates that you sell older stock first. It’s very important in stores that sell products that spoil or have expiration dates, like food, personal care, and cosmetics. Even if you don’t sell goods that expire, FIFO is good to follow since packaging changes and fades over time and goods that sit around for too long tend to look old. FIFO methods aren’t complicated, you just shelve or store new arrivals behind older goods. Because you look a bit closer when shelving, it helps catch misplaced items and keep your stock under control. Receiving stock shipments promptly and correctly helps prevent all sorts of inventory shrinkage headaches. Receiving best practices dictate that every stock shipment is carefully checked to ensure the goods shipped match what you ordered, and to catch vendor errors, shortages, and any shipping damage. Only after stock receipts are fully vetted should inventory numbers be adjusted. If not, sloppy receipts lead to inaccurate numbers, missing inventory, and payments to suppliers for stock not received. 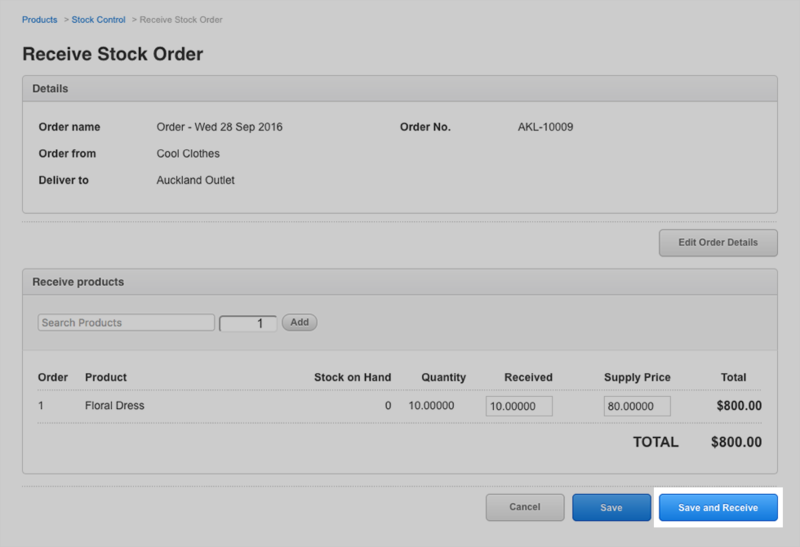 Stock receipts automatically adjust your stock-on-hand numbers in POS systems like Vend. Damaged goods are unavoidable in a retail store. Inbound stock can be damaged in transit and customers damage products then reshelve them to avoid having to pay. When damage is uncovered, it’s important to quickly adjust your stock count then dispose of the item. If you don’t, your counts will be off and the missing unit will look like as shrink issue later on when the damaged good is long-forgotten. Shoplifting and other forms of external theft are the leading cause of inventory shrink for all types and sizes of retailers. It’s important for retailers to first have inventory controls like accurate receiving, regular cycle counts, and a POS system like Vend in place to even spot shoplifting and other consumer theft issues. Along with using stock-control procedures and tools to spot problems, a few added deterrents help in the fight against retail shrink. Here are five simple and inexpensive ways to send shoplifters packing. When planning your retail store layout, positioning your checkout near your store’s entry helps deter both grab-and-run thieves and more savvy shoplifters. If you can’t place it at the entry, make sure it checkout has a clear line of sight to the door. Train staff to greet every customer as they enter so would-be thieves know they’ve been seen — and could be described to authorities. Don’t be afraid to let customers know you’re watching them. Honest customers won’t care and dishonest thieves will be warned — and hopefully leave. Security mirrors and video cameras can be placed to cover areas that are hard to see from the checkout and other staffed areas. If you do suspect a theft, video footage can be provided to authorities, used for any insurance claims, and is even helpful as a training tool for staff. Back all of this up with a few simple sign warning thieves they’re being watched and that you actively prosecute. 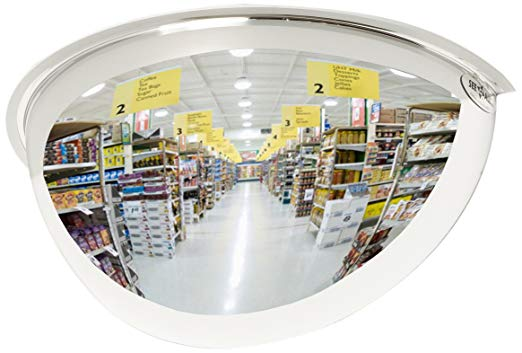 Domed security mirrors are inexpensive and let would-be shoplifters know you’re watching. Find them on Amazon starting at around $60. Use locking display cases and place displays of high-cost goods near regularly staffed areas, such as your checkout. Simple deterrents like these are very effective in stopping light-fingered shoppers. Don’t let customers browse or head into dressing rooms with large shopping bags. Offer to lighten their load by holding these for them at your checkout or other areas where you can protect them — and your products. Train staff to look out for any suspicious behavior and to report it without hesitation. Have staff assist customers in the dressing rooms and pay attention to what goes in and comes out. During checkout, train clerks to spot-check that purchased purses and bags are empty and that tags are a correct match to goods. Also, teach staff to watch that customers leave wearing what they came in with — not goods from your racks. Employee theft is a frustrating, and sometimes uncomfortable, situation to deal with. Every retail store owner eventually comes across a less-than-honest employee. But even otherwise loyal staff sometimes push the limits by stacking discounts or giving employee discounts to friends. Since employee theft accounts for nearly one-third of inventory shrinkage, according to the NRF study, it’s something that every retailer must address. 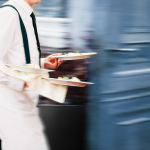 Here are five ways to protect your business from less-than-upstanding staff. POS systems that support unique staff logins, like Vend, give retail store owners a powerful tool to prevent employee theft-related inventory shrinkage. Assigning each staff member a unique ID makes it easy to track every transaction they make. POS systems like Vend let you see detailed reports, and see which staff member handles receipts, sales, inventory adjustment, returns, and even applied coupons to sales. If shrink is uncovered, like a stock receipt that doesn’t match the vendor’s bill, you can see who logged the receipt and investigate the issue. A POS system like Vend supports unique user IDs and lets you set permissions per-user, shown above, to control which staff members have access to critical data like stock counts and pricing. With a POS system, you can pull employee login reports and review sales profitability, discounts applied, and stock adjustment activities. If anything looks amiss, you can investigate and make sure it’s not connected to theft. Don’t hesitate to use video cameras in your stores backroom, break, storage, and receiving areas. Employees have access to many out-of-the-way spots in your store and that’s where theft generally occurs. Review footage regularly to ensure staff is not taking advantage. Stock counts and receiving tasks are opportunities for dishonest staff to steal and hide it within inventory adjustments and stock receipts. Having a two-person stock check and receiving system ensures a second person is reviewing the numbers. If you’re afraid staff might be teaming up on theft, step in yourself to make sure number add up correctly. Limiting staff access to just the systems and areas they need to get the job done is very effective in preventing retail shrink from employee theft. With a POS system like Vend, you can assign specific permissions to staff IDs that allow or disallow actions like stock adjustments, price changes, and purchase order receipts. This way, only employees that you trust can access shrink-sensitive data. You can also physically limit access to expensive goods and cash by locking storage areas, offices, and displays — and only give trusted employees or managers keys. Inventory shrinkage is part of retail life, but there are many ways you can minimize inventory shrinkage and related losses. Retail shrink can be grouped into three different categories — clerical and stock management errors, internal (employee) theft and external (customer) theft. Theft-related shrink is by far the most common problem but clerical errors and stock mismanagement accounts for a fair portion, too. Addressing and improving stock control and staff training is step one in combating retail shrink. A POS system with robust inventory tools and staff controls like unique user logins and permissions help retailers control stock data and track staff moves within the system. Vend POS does all of this and more. From barcode labels and iPhone scanner apps to detailed reports on both stock and staff, it delivers the tools needed to fight retail shrink. With a POS system and sound stock control procedures in place, the next step is curtailing theft and conducting cycle counts to quickly spot shrink. Installing security video cameras and mirrors are one solution, but a visible sign threatening prosecution and staff awareness training can do the trick, too. How do you protect your retail business from inventory shrinkage? 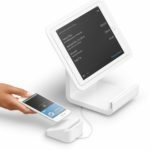 Do you use a POS like Vend along with some of the security measures covered above? We’d love to hear how your solution works in the comments below.